Guests: Ten people signed in as guests. However, there were many more guests than ten. The room was very crowded and there was an overflow into the hallway. In addition, some guests that had attended prior meetings did not sign in. Chair Angie Eells called the Meeting to Order at 6:30 p.m., and she requested and received unanimous approval of the Agenda. The pledge of allegiance was followed by the call to order. As our State Committee Member, Angie Eells gave a report on the activities of the Committee and submitted them to Pam Davis, Secretary. 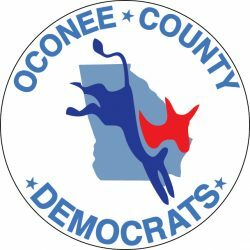 Affiliates were recognized: Rocky Rafael from the Clarke County Democratic Committee and Courtney Davis from the Oconee Progressives were recognized and welcomed. Rob Mischler from Greening Georgia discussed the mission of Greening Georgia. Other guests included candidates Deborah Gonzalez who is running for the seat currently held by Regina Quick and Chalis Pomeroy Montgomery who is running as one of the Democrats hopeful to unseat Jodi Hice in the 10th District. Program: The Candidate Recruitment Subcommittee invited local elected officials to share their experiences and advise on the election process and what their elected positions entail. The panel guests were Spencer Frye, Norman Garrett, Penny Mills, Violet Dawes and Paul Dotterweich. Candidates Deborah Gonzales and Chalis Pomeroy Montgomery also spoke during the program. Recognition Of Newly Elected OCDC Members: There were three newly elected OCDC members: Tracey Wyatt (District 1), Jennifer Gude (District 2) and Freeland Abbott (District 3). Chair Angie Eells read and submitted a report of her activities in June. Secretary Pam Davis called for additions or deletions to the previously circulated minutes of the May16, 2017 Business Meeting. Receiving none, she called for a motion to approve the minutes as submitted. Dan Matthews made the motion; it was seconded by Margaret Holt and unanimously approved. Past Chair, Margaret Holt had no report. The Communications Committee: Chair, Freeland Abbott stated that the subcommittee met on June 10th. He discussed the accomplishments the committee has made thus far. The Affirmative Action/Membership Committee: Chair, Jennifer Gude stated that the subcommittee met on May 20. She reported on the items discussed at that meeting. The Candidate Recruitment and Development Committee: Chair, Tracy Wyatt discussed the activities of the committee and their future goals. The Special Events and Fund Raising Committee: Co Chair, Margaret Holt announced that this committee had met earlier on this day and discussed several ideas for upcoming events. A subcommittee meeting was scheduled in July but cancelled. Caucus Liaisons: Carolyn Crawford, Veterans Affairs Liaison had nothing to report. County Advisory Board Updates: Robert Wyatt was absent but had communicated that he had nothing to report. New Business: On behalf of Wendy Wade, Margaret Holt, informed the meeting that the upcoming 8th Annual White Linen Scholarship Gala will be held on Saturday July 22, 2017 at 7pm at The Classic Center. Please contact Wendy Wade for more information and to purchase tickets. Upcoming Events: No upcoming events to report. The next OCDC meeting will be On August 15, 2017 at 6:30 pm at the Watkinsville library.